No one likes to open the door to their home and have their guests greeted by a mess. However, do you know why, beyond social pressures, it is important to keep your home clean? 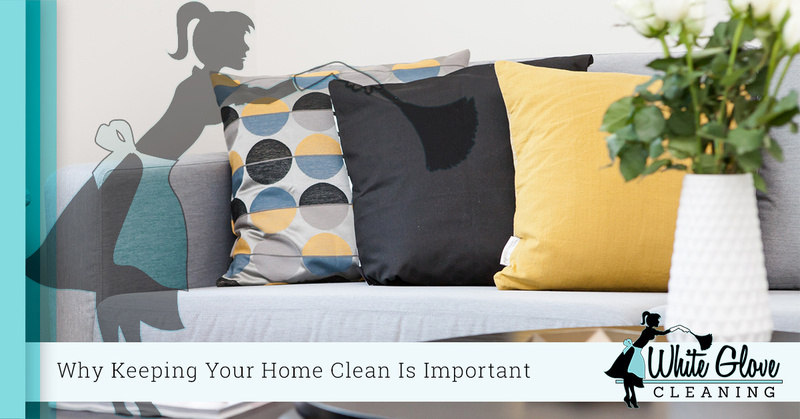 Read on to learn more about the importance of a clean home. Remember, if you have fallen behind on housekeeping, or you simply want more time to handle other important tasks, schedule our team for house cleaning services. We can help ensure your home is sparkling clean through weekly cleaning services or even a one-time deep clean. One of the top reasons you should keep a clean home is that a dirty home can lead to the growth of unwanted germs and mold. Germs are an obvious issue, as they can cause you and your family to become sick. However, while mold might not sound as scary as germs, it can be extremely harmful to your long-term health. Mold spores can be inhaled and aggravate your airways, leading to allergic reactions and damage to your lungs. Bathrooms and kitchens are the most susceptible to mold and mildew growth, as well as germs, due to the higher moisture and humidity levels. Make sure that these rooms are cleaned frequently and thoroughly to prevent the growth of germs, mildew, and mold. Those crumbs hiding behind the couch and that leftover dish laying out on the kitchen counter can be the perfect welcome sign to a host of pests. From ants to mice to creepy crawlers in between, when your home is a mess, you create the perfect home for unwanted guests. Make sure that clutter is cleaned up frequently and that any food particles are swept up right away. The longer you leave piles laying around your home and dirty dishes unwashed, the more likely you are to wind up with a pest infestation. Not only will a dirty home be the perfect place to grow mold, cultivate germs, and raise pests, it will also lead to permanent damage to the property. For example, if you spill coffee on your countertop and wipe it up right away, no harm, no foul. If that same coffee spill is left to sit for a week, you might permanently stain the countertop. Grime that builds up behind your furniture or along the base of appliances can turn into a permanent fixture if it isn’t handled in time. Not only will this be less than pleasant for you to live with, it can also devalue your home. The longer you leave your home a dirty mess, the stronger your chances are for permanent stains and difficult to remove grime. If you simply don’t have the time to keep up with your messy home, hire the best! Here at White Glove Cleaning, we can provide you with professional house cleaning services that will protect your abode from damages, germs, and pests. Talk to us today to learn more about how we can help you keep your home sparkling clean.